He mentioned that he wasn't a very religious person but still called out to God and put things in His hands. I wonder as he reflects on the events that transpired... the van hit the "safe" side of the road, a fireman in training just happened to come along, the were uninjured, and a nurse gave them a ride 60 miles to pick up a rental car... if he has remembered to thank God and re-evaluate his faith journey. He didn't mention any of that as he summed things up, he just noted that people were "there." God has given him a chance for a new start. I hope he takes it. Interesting theory, Jon. 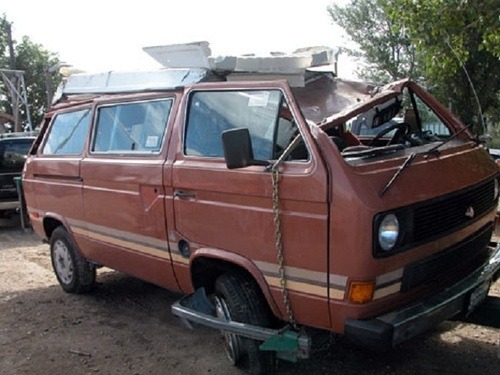 Why would this all-powerful, all-knowing, all-loving God let the Brykman's Vanagon flip over in the first place? He must have been looking to spice up their honeymoon with this hilarious little incident. What a character, that God! Always such a prankster!